Memphis, TN The Cotton Board recently went live with an improved version of their consumer Web site, www.cottonboard.org. While the URL to get to the site remains the same, the look and functionality of the site has been completely revamped. The Web site offers users the opportunity to browse for information about the Cotton Research and Promotion Program, sign up for Cotton Board newsletters, view and filter industry meeting dates in their area and much more. The "News" section of the site houses a video gallery as well as all the latest newsletters and press releases from The Cotton Board. "We wanted our audience to be able to take full advantage of all the resources our Web site offers. 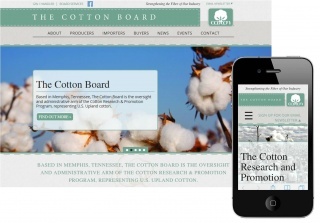 The new design of www.cottonboard.org makes the site much easier to navigate and offers user-friendly functions such as adding cotton industry event dates directly to an electronic calendar such as Outlook," says Lexie Jones, Director of Information Technology for The Cotton Board. " The Web site was also created in a responsive design to ensure that it automatically adapts to all devices, including mobile phones, tablets and computers," adds Jones. The Cotton Board Web site is also home to a full roster of board members and alternates, a staff directory and will continue to provide gins and first handlers the option to make electronic reports and payments. Please visit www.cottonboard.org to explore the site and take full advantage of this improved resource.